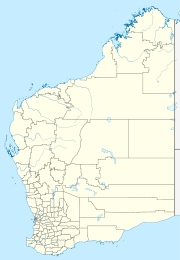 Rosa Brook is a town in the South West region of Western Australia. It is located 288 km south of Perth and the closest populated town is Margaret River. Rosa Brook has a community hall and a local store which was established in 1932 by the Darnell family. The region is best known for farming beef and lamb in addition to harvesting wine and olives. ^ Australian Bureau of Statistics (25 October 2007). "Rosa Brook (State Suburb)". 2006 Census QuickStats. Retrieved 2009-04-14. ^ "Main Roads WA - Distance from Perth". 2008. Archived from the original on 2008-07-26. Retrieved 2008-04-14. This page was last edited on 25 April 2018, at 04:23 (UTC).